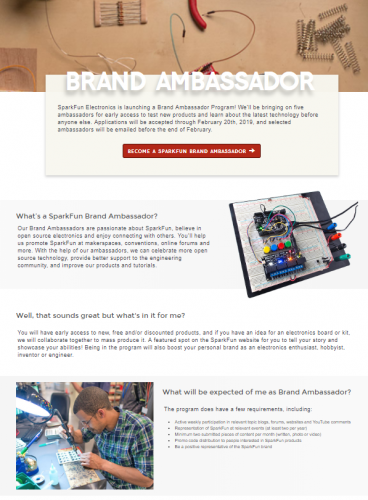 SparkFun is launching a Brand Ambassador Program! We’ll be bringing on five ambassadors for early access to test new products and learn about the latest technology before anyone else. Check out some of the details below. Our Brand Ambassadors are passionate about SparkFun, believe in open source electronics and enjoy connecting with others. With the help of our ambassadors, we can celebrate more open source technology, provide better support to the engineering community, and improve our products and tutorials. There are a number of benefits and expectations once brought on board, which we go over in detail on our Brand Ambassador page. Click the button below for more information, as well as an application!